First of all, let me express my deepest sympathies to the people of Nepal. I have had the pleasure of visiting Nepal repeatedly, I have walked those mountains, once a 180 km road and ones a 200. I have engaged intensely, and in this hour, I salute like you, their courage, their resilience, their determination. And your leadership and martialing SAARC resources in this crucial hour are re-assuring to the people of Nepal and to the people of the region. Natural disasters does not respect boundaries and I hope that with the launching of the satellite, the SAARC satellite, that is one of your initiatives, we will be able to predict, prepare and deal much more effectively with natural disasters and change environmental conditions, because we must bring the potential of the SAARC, that is still the least economic integrated region, yet with the most potential to the far, and all of us joining forces to make SAARC an economic reality would be an extra-ordinary step forward. 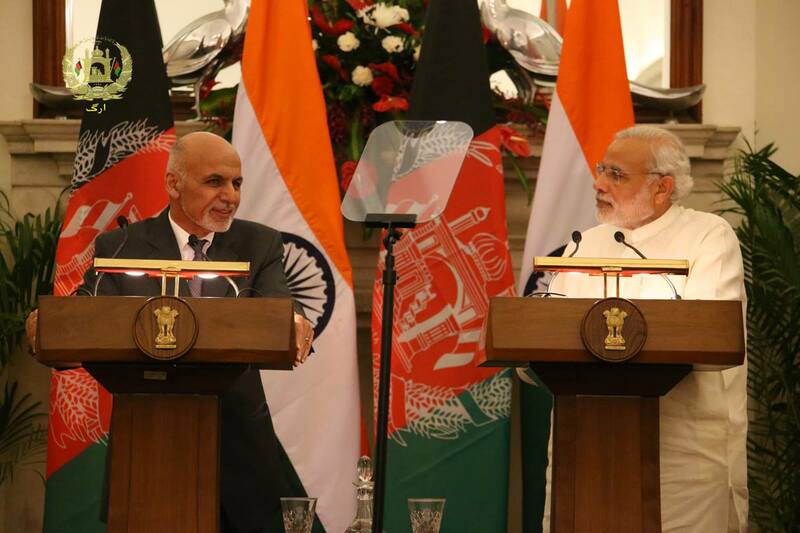 India and Afghanistan are bound by a million ties through millennium. Our ambassador was telling me that there are an estimated 30 million people in India who claim decent from Afghanistan in various parts. Yesterday, I had the pleasure of meeting with people who after 200 years of living speak still Pashto or dari of absolute pure cadences. That is an indication of the ties that we have had, and the past year is a guide to the feature. Other regions need to overcome their past in order to build the future, we can build a future based on appreciation of our past. Afghanistan was a roundabout, a place where ideas, people, goods came and flowed from south Asia to central Asia to west Asia. Our vision today is to be guided by that potential, where again, the energy of central Asia will flow to south Asia where pipelines, fiber-optics, railways and connectivity, air, ground and virtual would connect us. In this regard, we very much welcome your emphasis on the bilateral and multi-lateral transit and transport agreement, Attari Waga is a desired destination for us. It would allow Afghan goods to again reach this vast market, and may I take a moment to thank Tagore. Kabuli Wala has done more to give us a brand that we could not buy with a billion dollars of advertisement, so I am delighted that the old version is being watched, and a new version is being prepared, that will give you a much more authentic setting inside Afghanistan. I speak of Tagore because I was raised on Tagore by my grandmother who lived in Dera Dhon, in Lahor in exile, and was educated, and those are the personal type of ties. India’s own story has been well-understood and often commented. The continuity, the vision, the remarkable transformation. But India’s impact on others is not been as much understood. My generation growing in 1950s grew on Indian texts and people. Abul Kalam Azad, Mahatma Gandhi, Jawahir Lal Nehro were not names, but ideas people leader, so I would like to pay tribute to Indian democracy, to the discourse of rule of law, to the discourse of equality, to the discourse of engagement and transformation. That is where we join together because Afghanistan’s quest is for democracy. We have through the formation of the government of national unity, and let me convey the best regards of Dr.Abdullah and the vice presidents and other members of the cabinet who are not here, as well as the Afghan nation to you. Our political state craft has shown that divisions of the past are not going to be the confining limitations of the Afghan imagination. The formation of the Government of National Unity is a tribute to the desire of the people for unity. Peace Mr. Prime Minister is our significant goal because the shadow of terror haunts our children, our women, and our youth. What people in the rest of the world take for granted namely for a young girl to go from home to school and return, is still an exception to us. Terror must be confronted and must be overcome. We are determined to make Afghanistan the graveyard of terror. Our well must not be underestimated and we will not be beaten into submission. But terror, if it’s to be contained, and if the disease is to be cured rootstock and branch, requires a regional framework of peace and cooperation. We are determined to change the regional nature of cooperation against all forms of violence what is essential is that the state system in the region rises to a new understand. Terror cannot be classified into good and bad. It cannot be differentiated. We must have a unified approach, we must be united both in the region and globally to contain this phenomena. That is the legacy and Afghanistan today is fighting the battle against terror on behalf of all our partners and neighbors and we appreciate your moral support and your understanding of our quest for containment. I would like to also express thanks for India’s very generous assistance. Over 2.2 billion dollars have been spent, a most significant part of which is in the formation of the human capital. We have 13,000 Afghan students today, in Indian university and this of course will be the ground for formation of new ties and expanded ties that would enable generations to come, and your support in this regard and the intensive discussions that we had, to turn the potential of Afghanistan into an actual reality is highly appreciated. Indian investment is important to us, and we would like very much to see coordination, transport access, not only through Pakistan, to Waga Attari, but also to Chah-Bahar would be crucial for a country that is a dual nature; Landlocked if you look at geography, and a land-rich in a roundabout if you look at political economy. We look forward to an Asia that is economically integrated, that we are profound and lasting peace between states prevails, and where we allow the incredible energies of our people, the entrepreneurial talent for which south Asians are best known, to tackle our greatest enemy; poverty, exclusion, discrimination. In that quest, Mr. Prime Minister, I want to thank you for both your leadership in India, and SAARC, and for your support for Afghanistan. It has been a pleasure and we are looking forward to receiving you in Kabul. I hope that you would not only come to inaugurate the parliament that is a very appropriate gift from one democracy to another, but to visit the Bamyan valley and some of our other sites as well.